Well, I probably wouldn’t remove those from my demons if they came equipped with them, but I wouldn’t be too eager to copy those to anyone else. The main problem I see here is that body status effects usually are very easy to apply and to keep reapplying. Low cost, high success rate, so it doesn’t really matter if I reduce that infection duration from 5 to 4 because after enemy’s turn it will be 5 again. What if cleansing aura reduced duration of effects from all allies but in slightly lesser range. Heart could be useful in some situations. like with quick summon+dismiss. Iron hearted targets should probably be lesser priority for healers with cleanse. Mind equivalent of those would be very good though because usually mind effects come from whispers and you can’t just spam them non-stop. The AI usually doesn’t like to re-apply a status effect that still decent amount of duration left. It will do so if it is part of another ability of course (Infectious) or an area-effect, but it usually considers refreshing to be low value until the duration’s nearly gone. 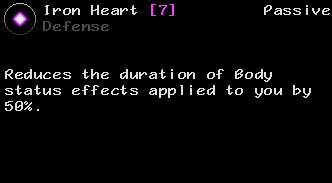 Moreover, all of the most serious status effects are not refreshable, even if artificially lowered in duration: Paralyze, Sleep, Charm, Panic, Blind, Stone, etc. These also tend to have relatively short durations as it is. That said, I do expect some variants to be more/less useful than others. As you suggested, Calming Aura is probably going to be the most beloved of the much: *all* Mind effects are in the “no refresh” category. 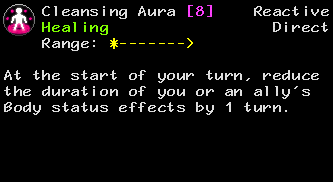 Normalizing Aura will be interesting perhaps, since elemental status effects have very short durations in many cases to begin with. I would also point out that even in cases where the AI does decide to just re-apply, Auras/Iron skills will force them to do so much more often. An enemy that might have moved on to a new strategy or been able to spread their efforts to multiple targets will instead be stuck trying to keep the effect applied on a smaller set of targets. When I mentioned re-applicability I had in mind chindi, preta, zombie, sankai, etc, basically demons who come in packs and mostly use 1 same attack that causes body status effects. Even with cleanse it’s difficult to stay clean and shortened duration won’t make it any better. In tier 2 druj and acheri achieve similar results with vile dance/sepsis wave/contagion spam. They don’t use their skills if somebody has infection for slightly shorter duration – they use it because they don’t have anything else to use. In fights with 2 or more drujes even body resistant demons usually end up dealing with lvl 2 poison. But mind stuff will be useful indeed. Matter too, considering how short those effects are. Heh, I presume there will be funny interaction between shortened duration of matter effects and harden (just like with resolute+harden) where you will turn to stone faster thanks to your passive . Are these going to reduce duration of stun/shock? Yeah, auras don’t help much versus passive, high odds reapplications, or cases where the demon has nothing else to do. This is appropriate though: if passive auras were hard counters to status effects that are being persistently and repeatedly applied, that’d be pretty OP. Stun, Shock, and Harden are all special cases. Going to try letting Auras do it and see what happens, but I think I ran into a problem with that w/ Resolute, so it may end up not applying for those.